Published: Dec. 30, 2013 at 06:22 a.m.
(1:37) (Shotgun) R.Tannehill pass deep middle intended for M.Wallace INTERCEPTED by D.Milliner at NYJ 12. 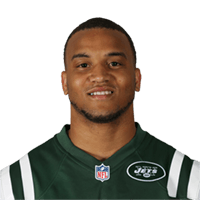 D.Milliner to NYJ 24 for 12 yards (Mar.Moore). Published: Dec. 30, 2013 at 05:16 a.m.
(4:09) (Shotgun) R.Tannehill pass short right intended for M.Wallace INTERCEPTED by D.Milliner at NYJ 22. D.Milliner to NYJ 22 for no gain (M.Wallace). PENALTY on NYJ-M.Wilkerson, Unnecessary Roughness, 11 yards, enforced at NYJ 22. The Replay Assistant challenged the incomplete pass ruling, and the play was Upheld. Published: Dec. 29, 2013 at 04:06 p.m.
New York Jets defensive back Dee Milliner intercepts Dolphins quarterback Ryan Tannehill to clinch the victory for the Jets. Published: Dec. 23, 2013 at 05:28 a.m.
(9:22) (Shotgun) J.Campbell pass short right intended for G.Little INTERCEPTED by D.Milliner at NYJ 20. D.Milliner to NYJ 39 for 19 yards (M.Gray).